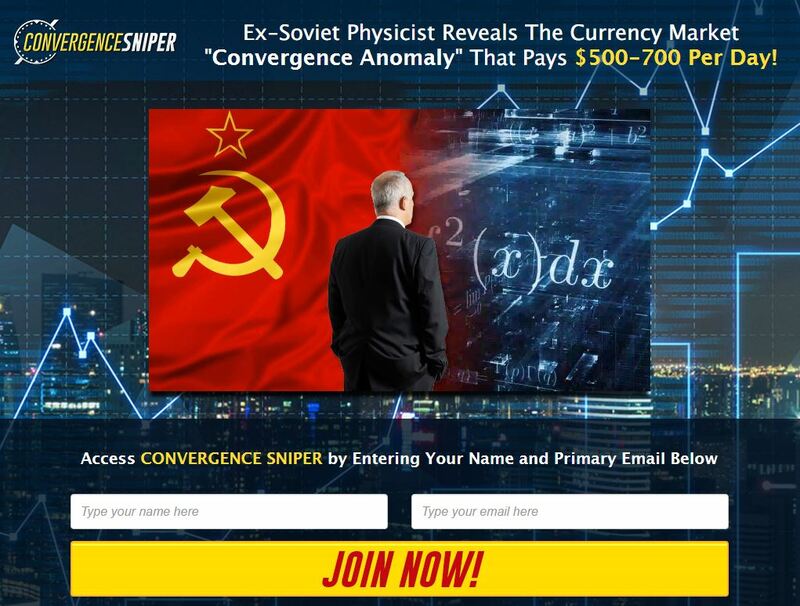 In this review we explain that “Convergence Sniper” is a binary options scam. It is presented by Frank Norton. 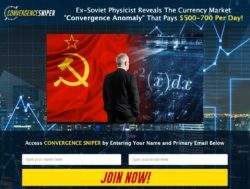 According to Norton Convergence Sniper is a binary options trading software based on an anomaly discovered by an ex-Soviet physicist Dr. Vladimir X. Thanks to a special algorithm it allegedly makes $500 – $700 per day. It should have a 84.9% win ratio. And as usually becoming rich is free, so you can get a free Convergence Sniper license as a beta tester. We are dealing here with a typical scam scheme. People who created this scam are getting paid for sending new depositors to a certain broker. So they need to convince you to deposit at least $250 with their broker, because this how they earn money. This is why they made up this story about Convergence Sniper and Dr. Vladimir X. They need you to believe that they can make you money. But in reality their software is useless and will lose your deposit if you trade with it. Everything you hear and see in the Convergence Sniper presentation is a lie. Starting with Frank Norton and Dr. Vladimir X.
Norton’s photo is a stock photo, this guy simply does not exist. The guy speaking in the video is just a paid actor. Several people say that they are making great money with Convergence Sniper, but they are paid actors. Look at the example on the right, you can hire this guy for 5 dollars on Fiverr. This is not the first time he is endorsing a binary options scam, we know him. As we have already said, Convergence Sniper is not free, you will have to deposit at least $250. Otherwise they won’t let you use the software. So you are pushed to immediately risk your own money with an app that you could not try on a independent demo first. Conversion Sniper is a typical scam that is going to lose you money if you trade with it. It is designed to make money to scammers only. Free systems that make money do not exist. Making money with binary options is possible with a sound strategy only. You can try to build your own strategy on a free demo account if you are interested in binary options.